Woodland sprites and crafty magicians, wise women and dancing faeries leap out from the vibrant cards of the Waking the Wild Spirit Tarot. Created by artist and Wildwitch Poppy Palin, this one-of-a-kind Tarot brings the inspirational magic of the wild into the everyday world. In the companion book Stories of the Wild Spirit, the characters portrayed in the cards tell their own stories, using first person dialogue to immerse you in their tales and call forth the power of their energies. This unique approach provides a new way of working with the Tarot for those who learn more easily through strong visual cues and evocative prose, rather than elaborate lists of correspondences. This boxed kit includes a 78-card deck and a 336-page illustrated guidebook. 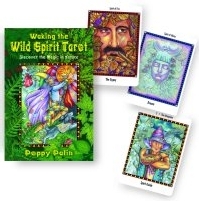 Perfect for those who want to reconnect with or have never lost their sense of wonder at the divine magic of nature, the sacred art and sparkling prose of the Waking the Wild Spirit Tarot will enchant and enlighten.